This week for the 52 Weeks of Canes, one of our projects was the pixelated retro cane. 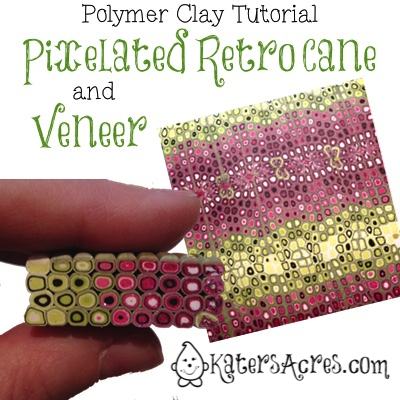 This pixelated retro cane tutorial originated from Bettina Welker. I in no way, shape, or form came up with this design idea on my own. This being said, please see Bettina’s highly detailed tutorial here. 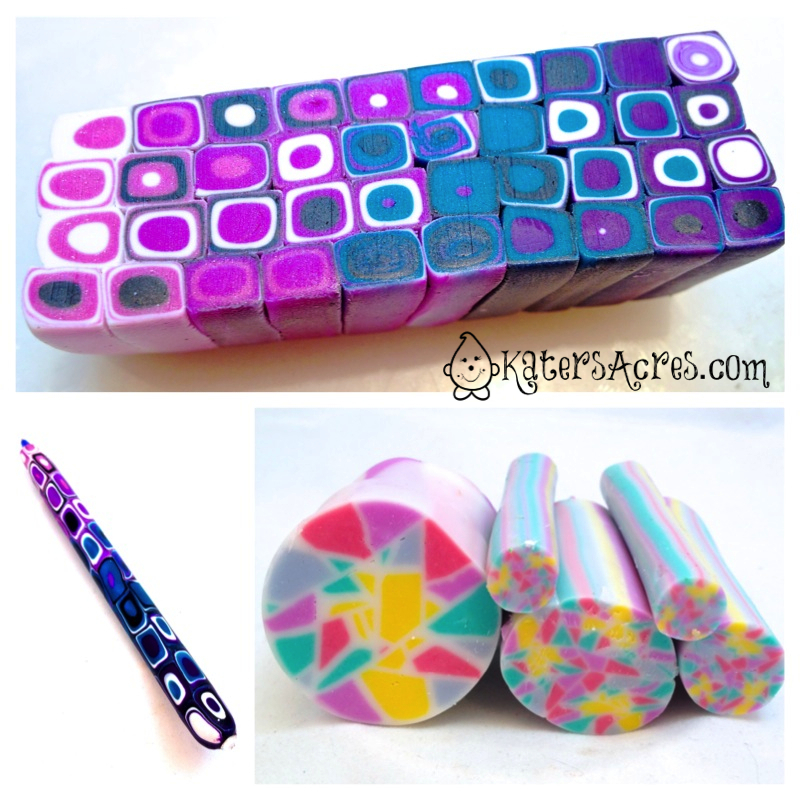 Thanks for the awesome tutorial Bettina, from me & all the clay artists around the globe. The first step in any design-work is to come up with a color palette. The color palette shown here I featured on the blog yesterday, you can see the clay colors I used here. I created a simple ombre blend for each of my two primary colors, and then using Bettina’s tutorial, I assembled my colors in their ombre color schemes. Again using Bettina’s tutorial, I extruded the clay into a very long strip, ran the strands parallel to each other, and then stacked them on top of each other as Bettina showed. This process resulted in the cane featured at left. I cut the stack in equal size thicknesses. I then lined them up next to each other, side by side. This created a really cool effect. 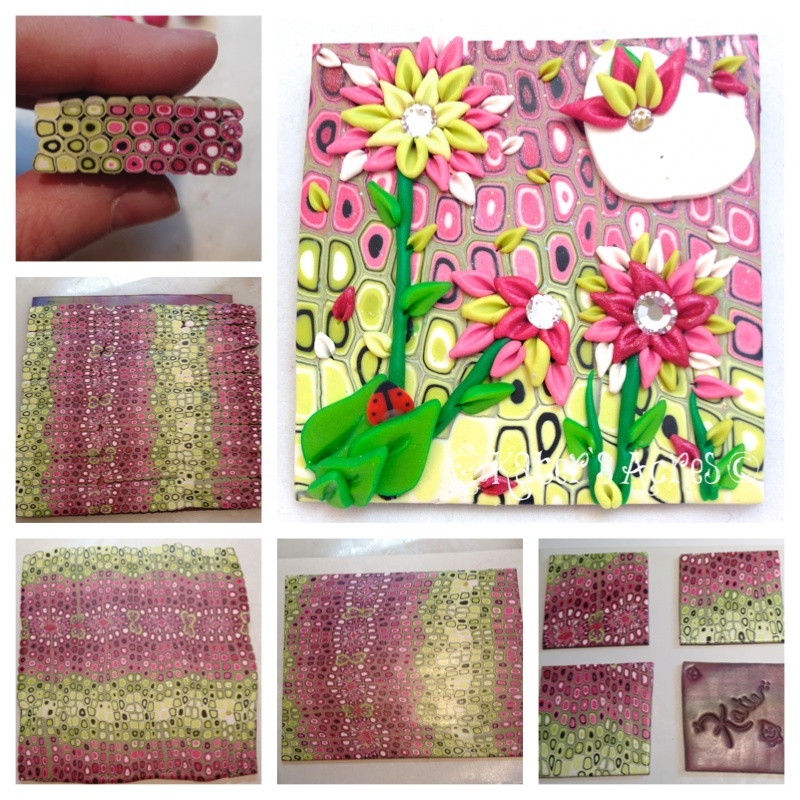 Then I placed the slices on a conditioned sheet of scrap clay. When all the clay was laid on the veneer, I gently took my acrylic roller and rolled over the sheet in even passes to smooth the seams. When all the seams were smooth, I passed the sheet through the pasta machine to even it out. Once the sheet was run through the pasta machine, I cut off the uneven ends. Then I cut the sheet up for twinchies! At left are my results for both of these canes. I was trying to get to Bettina’s tutorial and the link is broken then I tried a search on line and the page isn’t available for some reason. It has been over a year since I tried it but I think with your tips and pictures I could do it again.